Arend Louw’s Limbo denotes an intermediate state, something transitional. It’s a world where you are caught between two stages and it’s unclear what will happen next. Most scenes Arend paint are in limbo, an intermediate state that will change as soon as the sun sets, or as soon as a building is demolished or a open field is changed into a concrete jungle, a fleeting moment, but transitioning. Most of his paintings are forgotten or ignored places, sometimes very remote, with his focus on seeing something beautiful in them. In each painting there is something that intrigues Arend, something that resonates with his soul. The shape of the buildings, the colours of the sky or the contrast the shadows bring to the landscape so often seen, these are the things that mesmerize Arend, and what he paints. Arend was born in 1983, grew up in the Cape and finished a degree in Theology in Wellington. He always had a keen interest in art but it was only in Wellington that he started working in oils. 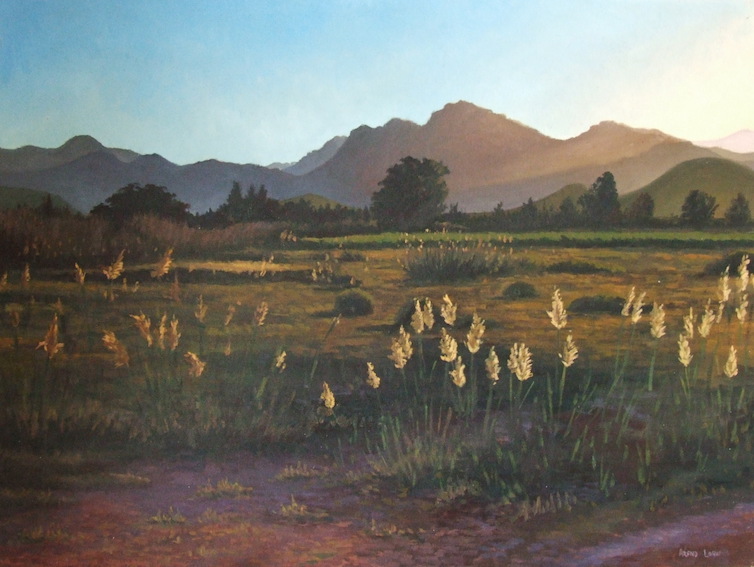 In 2012, after many years of painting and exploring in oils he decided to paint full time. He moved from Bloemfontein, where he was working in an art gallery, to the West Coast where he now lives on their family farm. Arend had no formal art training which enabled him to develop his own specific style. 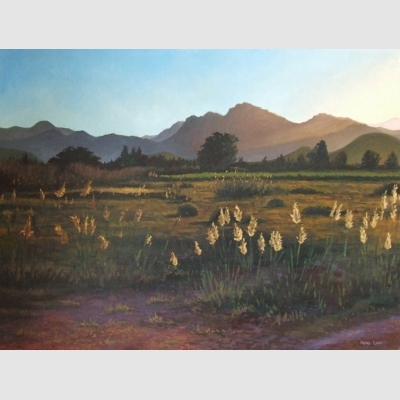 Artists that inspire him are Clare Menck, Brahm van Zyl and the late Walter Meyer. He works from photographs he takes himself and in a palette he created himself. His signature palette reflects a specific light that he captures, a light that makes the most mundane building or landscape explode with colour, a light that brings out the richness in a simple tar road and casts long shadows on old farm buildings. A rich light, usually referred to as the golden hour, although it actually lasts for about 15 to 20 minutes.